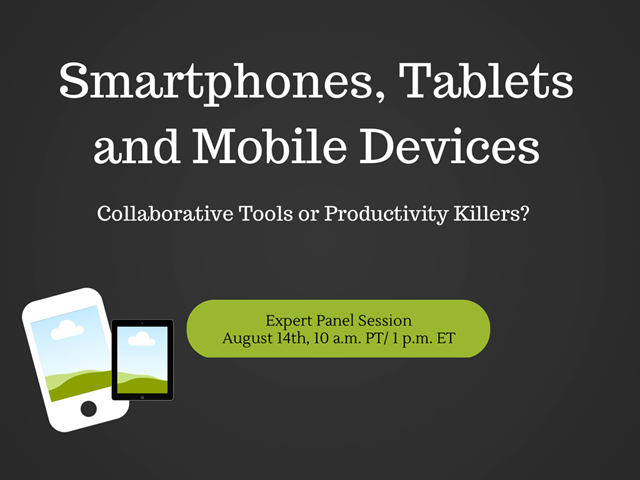 Smartphones, Tablets and Mobile: Collaborative Tools or Productivity Killers? The mobile revolution changed the way we do business - we are no longer tied to our computer screens at work. More and more professionals require the flexibility in working remotely and using their own devices like smartphones, laptops and tablets to communicate with clients and collaborate with team members. But many employers are still afraid that this new trend will cause day-to-day distractions and affect the cohesiveness of the work group with employees working remotely. Are these worries justified? Join the discussion of the latest trends in mobility and how they can help and potentially harm the productivity of your business. Find out the direction unified communications are headed and learn of the latest trends and technologies that you can implement within your business to attract the right talent and gain competitive advantage in the marketplace. Title: Smartphones, Tablets and Mobile: Collaborative Tools or Productivity Killers?